We had a great time. The condo was spacious, clean, and close to everything when using a golf cart. Great place for a Vacation right on the water. Awesome pool to walk down to from private stair case. The condo is clean and mostly up to date. Couch Mattress not very comfortable and needed to be aired out. Washer and Drier worked but drier took forever to dry. Comes with plenty of towels for both pool and bath. Great facility, Very friendly management. Perfect place for boaters! Loved it! Fantastic as always. Only issue this year was lack of ice available . Ice machine cleaned out early morning leaving several guests having to go buy ice, our group included . We found this place last minute after our original location cancelled on us. It was clean and nice. The staff was great! Decent pool. However it was advertised as sleeping 8, though they did contact us and say that the pull out couch was only suitable for children. It was not suitable for anyone! We bought an inflatable bed. The building is unfortunately located right across from the busy fire station, and it was noisy at night. Also, if you have a large vehicle, like a minivan, the parking lot is tricky! It is on the opposite side of the key as pretty much everything, so if you have kids, be prepared to drive and pay a lot for parking. I have been using Pelican Landing for over 20 years. If you are on a fishing holiday like me it is the perfect location. I would recommend staying at Pelican to anyone. Awesome place, great location, friendly service! A group of 3 couples stayed here for Fantasy Fest. The unit was a lot bigger than the pictures show. It was nice to have 3 real beds for all the couples. Unit was very clean. We accidentally booked the incorrect dates by one day off and the staff was so accommodating and moved our reservations for us. Highly recommend!!! Excellent! large rooms and comfortable! Nice condo with a pool and a bbq. Far enough from Duvall area that you will generally take a cab. 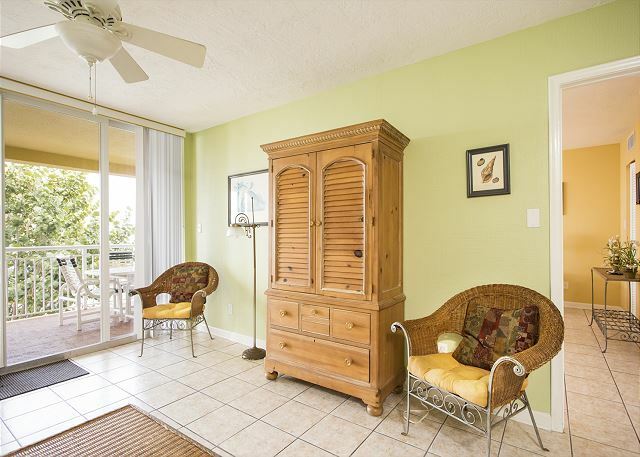 Very lovely and spacious condo with beautiful water views. Clean and in good condition. Private pool, patio, and bar area with grills. There's a park across the street with farmer's market on Thursdays. Take a short walk to Key West City Marina to see sunset. We saw a manatee there! Thank you very much to owner and to Key West Vacation Properties & Realty, especially Becky, for a wonderful time. We are very grateful. Hello Colleen, Thank you so much for your feedback we greatly appreciate it. We are very happy that you and your family enjoyed your vacation. Hope to see you again in the near future. Best place to stay in key west.. Thank you for your review! Our staff works very hard to ensure that our guests have a great time in Key West, and a wonderful stay at our Property! Hope to have you stay with us again. We enjoyed our week in Key West - this is close enough to all the happenings but not noisy. Loved the park across the street with all the tennis courts. Description was accurate. Mattress needs to be replaced. Rolled towards the middle. Minimal pots and pans. Would like larger fry pan. Safe in second bedroom ( and master bedroom ) were not working. Notified manager. She stated work orders in place. nice unit. heated pool was a comfort. Great views of the water from the back deck. 2nd year staying at this location for the Key West half marathon. Clean, nicely furnished and equipped, and convenient. I rented 2 properties for a bachelor and the whole group(including myself) was blown away by the quality of the apartment for the price we paid. Everything was spotless, the view of the bay was excellent and the distance from downtown was a short inexpensive cab ride. The unit was clean and had everything we needed for a long weekend stay. We did not have a car and found everything we wanted to do within a long walk or short cab ride distance. We were in town for the half marathon and will stay here if we come back to do it again next year. Hello Vaughan, Glad you enjoyed your stay. Die Wohnung war sehr geräumig, die Küche gut ausgestattet. Viel Platz auf der Terrasse und eine schöne Aussicht. Die Lage war o.k., Einkaufsmöglichkeiten in der Nähe, der Hafen und die Duval Street waren auch durch einen Fußmarsch zu erreichen. We were there for the Peterson's Poker Run. This was an excellent vacation place I recommend it totally. We have stayed here several times before but in another unit and the Dominica Retreat is much nicer. However we did kill 3 small roaches while we were there. We are planning on staying here again, but maybe this could be taken care of. Also in the second bedroom, the AC filter needs to be cleaned. That room was very hot the entire week. Other than that the place is great. The condo itself was nice and the management company was willing to help. Some of the guest were on the noisy side later in the evening but nothing over the top, and construction on Truman a little disappointing . We would absolutely consider staying again. I'm came down with a 7 total of adults & we all enjoyed our stay on the property. I'm hoping to stay with u guys in the future & have spoke very highly of located & how clean it was. The suite was nice. Had to get a Cab to Duvall, $4 pp. the living area and master bath were very clean. Only there one night. 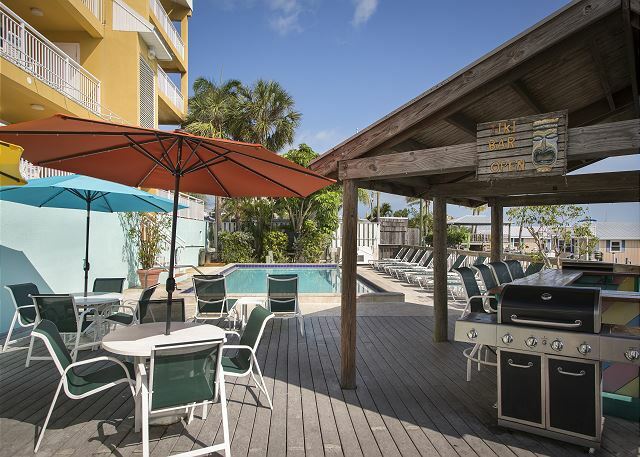 I think it is the only vrbo that allows a one night minimum in Key West. The price online showed $200, but cleaning fees and booking made it $343. The condo was nice, a few updates are in order. More cooking untesils and cookware would be nice. Overall, clean, nice location, friendly neighbors and friendly and helpful property management staff. Recommended by the four of us. From the begining to the check out, the experience was very good, very professional... Thanks. Hello Patricia, Glad you enjoyed your stay, hope to see you and your family again soon. Hello Claudia, Glad you enjoyed your stay, hope to see you and your family again soon. First impressions are key...with that said, the location was good, easy to find plenty of parking...however, the power was out when we arrived, thankfully we only had to lug our luggage up the stairs to the second floor. There was an issue with one of the bathroom door knobs which the management onsite took care of right away..(we had 4kids in our room). We had plenty of room for all and the kitchen was adequate for our needs. Nice pool, and bbq area. Was more than we expected. The location and accessiblity was great! Only a 5 min bike ride to Duval st. The unit was clean and well kept. Everything was provided for, from dishes, pots, pans and blender, as well as detergents and laundry inside the unit. Private access to pool and grill. Very pet friendly and accomodating. Staff was friendly and professional. We look forward to returning! Nicw place very good location and it was quite. The condo was exactly as we expected. However, 2 of the 3 TVs did not work properly. Staff said the fault was COMCAST??? We were very pleased with the Dominica Retreat overall. The comforters on the beds were oddly lumpy, but the bedding was clean. Our neighbors were very rowdy, but they apologized and tried to curtail their sound levels. We walked to Duval Street every day and rented bikes from nearby vendor for further exploration. Our dive shop was adjacent to us, so we walked over to the boat. We were able to relax and felt very comfortable there. Would definitely go back! Very nice rental property. Had a full kitchen and a boat slip. Would recommend it to a friend. I suggest new pots and pans for next year. I tried to clean one of the pots and after scrubbing for 20 minutes, the black build up on the inside was still not off. Also, the cleaning service only came one day of our 7 night stay. Kudos to the property manager. She was very helpful and friendly. I will definately be coming back with friends!